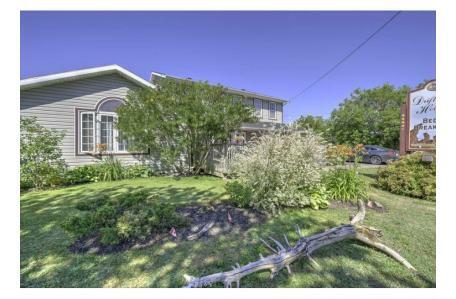 Currently operating as a Bed and Breakfast this commercial property for sale in Summerside could be suitable for an office, group home, community care facility, art or photo studio, accounting or legal office, restaurant, retail space, convenience store, or institutional or residential rental units. An extra lot next door is also available for sale that could provide space for additional office or rental units. The contents of the structure are negotiable, and this property could be available as a turnkey Bed & Breakfast. All 7 large bedrooms include deluxe en-suites, fitted closets, with the master suite benefiting from a jacuzzi and separate shower. The property was converted a few years ago from a photo studio. Viewing is strongly recommended to fully appreciate this stunning house. There are simply too many quality features to mention. Nearby businesses include: Livingston Steel, McCain Produce, Summerside Bike Works, NAPA Auto Parts. The Confederation Trail is a 2-minute walk away.